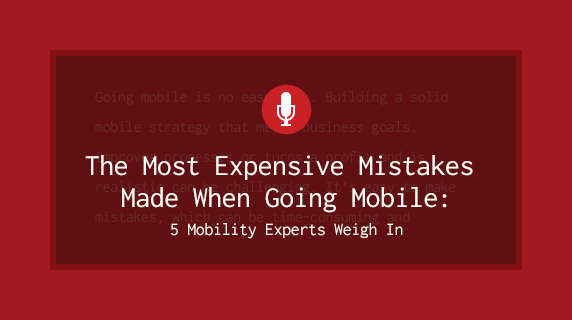 The Question: What are the most expensive mistakes you see companies making when they first start to go mobile? The Answer: Mobility as a technology paradigm is still seeking its equilibrium and, in my opinion, will be doing so for the foreseeable future. The fallout from this is that mistakes will be made as organizations pursue solutions and architectures in a market that is still evolving. In my opinion, this is ok, as a certain amount of risk is necessary to “get in the game” and use this technology to advance business goals. However, the flip side to this is that heavy investments in one platform or one vendor can make those mistakes expensive as the market forces continue to pick winners and losers and technologies leapfrog each other in capabilities. The antidote is to keep your options open by planning for a diverse landscape of mobility endpoints , avoiding disproportionate investments in proprietary solutions and limiting planning horizons to 18 months or less. The Answer: Whether you want to make a successful app or create a sustainable app business, you have to pay attention to people and analytics. It’s when app developers and companies ignore data and signals from these two sources that the problems start. It’s all about developing apps—and an entire experience—that puts people first. This means addressing real problems or desires with apps that allow people to accomplish what they set out to do. People don’t want to figure out how to use your app; they want to use it to ‘get stuff done’ or have a great experience. Wunderlist is a great example of an empowering and intuitive productivity app. It’s a no-brainer to use and allows the user to adapt the app to their lives and needs, not the other way around. Good apps, like effective technology, adapt to us. Miss a step here and it’s a slippery slope to bigger and more expensive problems. Analytics—even though it’s about data—is also about people. It’s all about having the capabilities to ‘listen’ to your users and what they tell you through their ‘data signals’. How they use their app and how often, what they use it for, and if they share. Harnessing analytics to ‘listen’ in to app behavior and interaction will give you important clues about how to improve your app, or simply add features your users will appreciate. That’s the ‘opportunity side’ of the equation. On the ‘issues side’, it’s analytics that will alert you to problems with your app before your users take their gripes to their social network or simply delete your app altogether. Harnessing both equips you to innovate your app and expand your reach. But that’s where I see app developers and companies risk making the biggest mistake of all. Many may pick up quickly on the ‘signals’ from users and analytics correctly, but they fail to move quickly to bake these insights into new releases of their app. The Answer: There are a few common mistakes I’ve seen when companies first start to go mobile. The first is porting existing web applications to mobile mostly “as-is.” The typical result is a terrible user experience and little-to-no adoption. Another common mistake is when companies build apps without analytics built-in. This basically equates to making an investment without the ability to measure return on investment and overall success. Also, analytics are crucial when it comes to making improvements in subsequent app releases. I’ve also seen companies attempt to use a single design for all form factors (web, smartphone and tablet). While there are times where this may work fine, a better approach is to think about the right design for the target device and the likely use cases for that device. Similarly, allowing sentiments like “HTML5 is good enough” to drive technology decisions leads to expensive mistakes. While there is a time and place for HTML5, the phrase “good enough” should rarely, if ever, be applied to user experience. The Answer: Many start with too broad a scope. Our customers who start with narrow scope (but a broad vision) tend to have wins up front that can continue to fuel the growth of the mobile program. Customers who start with iOS devices as first scope do well due to the consistent nature of the platform. From there expanding to a certain Android type—such as Android for Work enabled devices only, or a certain OEM such as Samsung also do well. Another common problem is when customers build the wrong type of apps. Customers who focus on building single-purpose apps that are targeted at workers who are frequently in the field or on the road tend to have the most success. Building all-in-one apps, with broad use cases, or attempting to mobilize a process for a user who is traditionally already at a desk do not tend to work and can be expensive mistakes in app development. The Answer: Most companies think of mobile as a channel, much like a web on steroids. Yet mobile is about consumer behavior. How you consume content changes dramatically. For example, mobile game developers use the term “Starbucks factor” to describe how a mobile game should be designed to provide a complete and engaging experience in under 2 minutes, the time it takes for the average barista to serve you. Mobile is also about new business models. Turning your users into co-creators that can adapt, customise and extend your product beyond its original design intent. A company that reacts to a competitor’s app will most often make the expensive mistake of competing on app features. Fewer companies understand that designing a mobile app is a cross-organizational process and requires integration with your corporate IT assets. Even fewer companies are able to use mobile apps to create a sustainable competitive advantage by turning their users into co-creators. It’s an expensive learning process.